mwe3: Tell us where youre from and where you live now and what do you like best about it? What other cities are you fond of visiting? Rajendra Teredesai: My family hails from the picturesque coastal Konkan region of the state of Maharashtra in India. I was born in Mumbai, pursued my basic education in Mumbai, Shahabad and Pune, and completed my mechanical engineering degree from Manipal. I have been living in the city of Pune since 1993. Pune is known here as the Oxford of the East. I love the vibrant scene of education, culture and music here in Pune. Among the several places that I have visited, I enjoy visiting Goa, California, where my son resides, Zurich, Salzburg, Vancouver, St. Victoria, Puerto Rico, Singapore and Barcelona, most. mwe3: How and when did you first become interested in studying music? Were the traditions of Indian music ingrained in you at a young age and when was the Indian flute taught to you and what were your early studies like? Rajendra Teredesai: My grandfather was an ace self taught classical violinist. I became interested in studying Indian music at the age of 12, beginning to learn vocal music and tabla (Indian drums) playing from local music teachers. Sometime around the age of 14, I picked up the Bansuri (Indian bamboo flute), as I was immensely captivated by its rich, deeply soothing and meditative sound, and started learning to play it on my own. Music being essentially in my genes, I picked up learning to play the flute rather well. My childhood was spent listening to a lot of good and diverse music  rich in quality and content. The years spent exhaustively listening to live concerts, recorded music, and music played on the radio, had a profound and lasting impact on my evolution as a musician. Further, I spent a couple of years learning from a local flautist Pandit Ram Bhat, in Manipal / Udupi. mwe3: Tell us about the Indian music legends you have met. You studied with Pandit Hariprasad Chaurasia, who is said to be the most famous of all the great Indian flute legends. And the other name was Ustad Sayeeduddin Dagar. Most westerners probably dont know those names. Were they the most important teachers you had? What other musicians had a major influence on you? Rajendra Teredesai: Even while I was pursuing my engineering studies, I continued practicing the flute intensely on my own. During this time, I chanced to listen to the flute of the legendary Pandit Hariprasad Chaurasia, both, in live concert and on tape. So deeply impressed and overwhelmed was I by his flute playing, that I made it my lifes raison d etre to study only with this great master. Later, around 1980, the most momentous period in my life, I had the good fortune of finally coming under his fold. 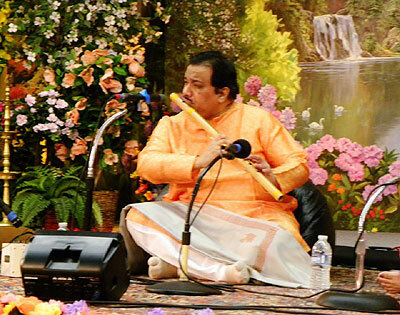 I learnt from him the finer aspects of flute playing in the traditional Indian one-on-one basis guru - student methodology. I spent the most fruitful and exciting 15 years of my life studying with him, listening to his recordings and attending most of his live concerts, with deep involvement and dedication. The journey was indeed difficult and demanding, as I had to squeeze in time to visit my Guru and practice regularly, even while I worked as an engineer full time to earn a living. At times, I would spend practicing vigorously 8-12 hours a day. Later, when I moved to Pune from Mumbai, I spent a couple of years learning the dhrupad style more deeply with Ustad Sayeeduddin Dagar of the illustrious Dagar family, who are considered the torch bearers of the ancient dhrupad tradition of vocal and instrumental music. You see, I incorporate heavily the dhrupad style of raga developments, improvisations and aesthetics in my flute playing. Still later, in my musical journey, Ustad Ali Akbar Khan, the late California based legendary sarod maestro had offered to teach me after listening to my flute playing. However, unfortunately, that was not to be. Besides the music of my Guruji Pandit Hariprasad Chaurasia, I have been deeply influenced by the music of the late Ustad Amir Khan Saheb, Ustad Nazakat Ali and Salamat Ali Khan, the veritable giants of Indian classical vocal music, and the late Pandit Nikhil Banerjee, the unparalleled sitar maestro. So, as such, I would consider them to be the most important teachers in my pursuit of musical excellence. mwe3: How would you describe the main differences between Indian music, which is considered Eastern music, and Western music, which is more traditional classical, folk and even pop music? Because of the Beatles and psychedelic music of the 1960s, Indian music now sounds very normal to our ears. In the past 50 years all types of World music has entered the Western consciousness. Rajendra Teredesai: Attempting to elucidate the differences between Indian and Western music would take me several hours of elaboration. Indian music, to my mind, has a deeply inherent spiritual quality to it. It facilitates a direct connect between the musician and divinity. Indian music purifies the soul and makes the musician one with paramatma. It is founded on the concept of unpremeditated, spontaneous, structured and unstructured improvisation. The highly complex nature of sur (melody) and taal (rhythm) dichotomy in a raga, its development, interpretation and interaction is too intricate and vast in scope to discuss here. Suffice to say that the repository of Indian classical ragas is so stupendously vast and rich in resource and content, that mastering and interpreting the ragas with utter perfection may be treated as an unending endeavor involving several lifetimes. A seasoned classical musician is able to improvise and play a raga impromptu for as much as a couple of hours without making it sound monotonous or repetitive, even while holding his audience in spellbound rapture. No notes or sheet music are referred to by the performing musicians. No two concerts are exactly the same. In a live concert scenario, no two musical moments may be exactly the same in terms of performance and aural experience. For me, Western music is equally fascinating, particularly jazz. mwe3: How many albums have you recorded and released in India and other countries? What about session work in India and also have you done film soundtracks? The influence of Bollywood is acclaimed worldwide these days. What other artists have you recorded with including guitarists and are there other Indian musicians can you recommend us to? 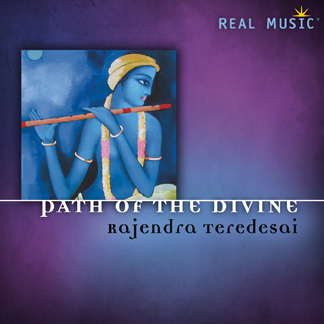 Rajendra Teredesai: Besides recording and releasing nine albums internationally, some of which have flute tracks played by me, I am in the process of releasing another three international albums during 2015. Besides these, I have recorded and released eight albums in India. No, I havent done a film soundtrack so far, but, would certainly love to do it for an appropriate film, something similar to Siddhartha, Seven Years In Tibet and Samsara. My approach to music is eclectic and deeply spiritual. I used to enjoy the music of the golden era of Indian movies of the 1950s, 60s and 70s. Sadly, the melodic and emotional content is quite lacking in Bollywood music today, So I dont subscribe to it, nor do I have any plans playing for Bollywood films. As regards my international collaborations, I have recorded several albums with Lucjan Wesolowski from Poland, Stephen Bellm from the US, and Blue Monk from Malaysia. I would certainly love to work and record with musicians like Peter Kater, R. Carlos Nakai, Richard Clayderman, John McLaughlin and Yo-Yo Ma. There are several talented Indian musicians in different genres of music, hence, naming any single one is quite difficult. 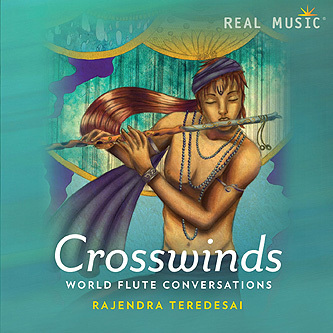 mwe3: Tell us about your 2015 CD on Real Music called Crosswinds, which is subtitled World Flute Conversations. When did you get the idea to record and release a CD of flute music from all the world over and how did you meet up with Terrence and Real Music? This is your third release on Real Music. 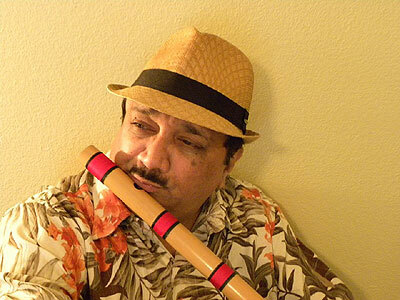 Rajendra Teredesai: Due to my fascination with woodwind instruments, I do play several flutes from across the world. 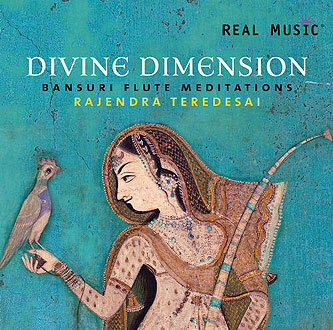 After recording and releasing Divine Dimension and Path Of The Divine, I had presented the idea of doing an album featuring world flutes to Terence Yallop at Real Music in early 2014. He loved it. It took me close to six months working on composing and recording the tracks of Crosswinds with Blue Monk. Terence loved the final result. However, it was a good six months of waiting before it was scheduled for release in April 2015. I had recorded three albums for a relatively unknown US based music label during 2011  2012. Unfortunately, the music company owner / producer died abruptly. My dreams of getting this music released were shattered. However, just when all hope was lost, Terence came along and signed me up for Real Music. Terence was truly a Godsend. I respect Terence a lot. He has a fine aesthetic sense and a marvelous ear for good New Age and meditational music. Hence, I believe my association with Real Music has been very rewarding and fruitful. And I look forward to releasing many more albums with them in future. mwe3: Tell us about your recording studio and how many instruments did you use to record the Crosswinds CD? Theres also a range of sounds on the CD and youre credited as playing everything. Its a great idea to blend Indian music with different instruments including electronica and programmed percussion. Rajendra Teredesai: I work from my recording studio set up at home, comprising of a host of Tascam, Korg and Zoom multi track digital recorders - mixers, Yamaha and Korg synthesizers, an array of high quality microphones, Yamaha monitors and recording / editing / mastering software. All the flutes in Crosswinds were, of course, played by me. I have worked closely with my good friend Blue Monk to get just the right instruments, melodic arrangements and percussion for all the tracks. It involved lot of active coordination and hard work. Moreover, each track had a story to tell. Hence, several demos had to be scored for each track, and fine tuned, till the exact soundscape was captured and delivered in the tracks. Instruments as diverse as the Tibetan meditation bowl, the Arabian darbuka, oud, Balinese gamelan, eagle bone whistles, Chinese erhu and harp, besides several others, have been judiciously deployed for added effect. Blue Monk is an extremely gifted composer / musician. We have a fine rapport and an excellent understanding, whereby we are able to translate our creative ideas into tracks composed and arranged to the highest standards of musical excellence. mwe3: Tell the readers about your flutes, the Bansuri. Which flutes did you use to make the Crosswinds CD and what are some of your favorite flutes? 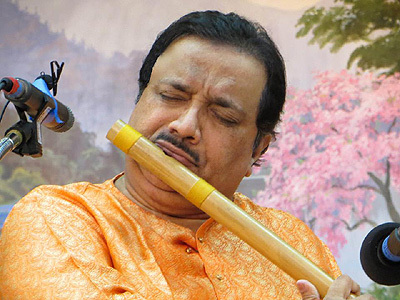 Rajendra Teredesai: I have over one hundred different flutes, ranging from the Bansuri, Native American flutes, Arabian flutes, Balinese suling, South American quenas and pan flutes, Chinese dizi etc... Some of these are specially crafted for my specific use. I have used different bansuris, the shankh bansuri (deep bass flute), the Arabian flute, the Chinese flute, the Balinese flute and the Native American flutes for the different tracks of the Crosswinds CD. Some of my favorite flutes are the Native American Flutes crafted by the expert flute maker Dana Ross. These are truly outstanding for their innovative design, sheer tonal quality and range. mwe3: What are the main differences between Indian flutes and flutes and other instruments from other countries? How many different flutes have you played over the years? Rajendra Teredesai: The main difference is, of course, the tuning. Flutes are tuned differently depending upon which country / culture they belong to. 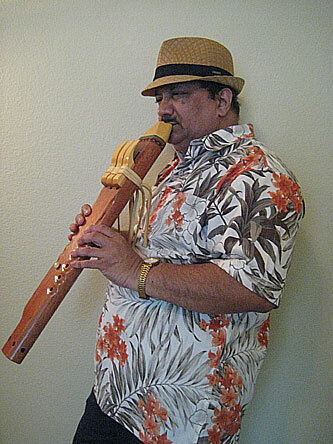 Another difference is the material of the body... some flutes like the bansuri, the shakuhachi and the suling are made from specially cultivated bamboo, others like the Native American flutes and the quenas are made from different types of wood, yet others like the Arabian kawala and nay are made from special cane or reed. Yet another difference is the blowing and playing technique and the design of the mouthpiece and embouchure, and whether the flute is side-blown or end-blown. mwe3: Are you also involved in other activities in other areas as well? What about other interests and how do you relax and escape the pressure of the world? Rajendra Teredesai: As a performing and recording musician, much of my time everyday is consumed in composing, playing and teaching music. I find little time for much else. However I do spend my leisure listening to lot of music, reading and watching movies. I particularly enjoy spending the weekend at my farmhouse on the outskirts of Pune, relaxing in the lap of nature. mwe3: What other plans do you have for your music during 2015 and 2016, including writing new music, playing live concerts and recording? Rajendra Teredesai: I am presently working on five albums planned for release during 2015 and 2016. Out of these, I have already completed composing and recording for four albums. Besides, I am also contemplating doing a followup album on Crosswinds, featuring again, world flutes. I do hope and pray earnestly that I can continue playing the flute till my last breath.